Have it all with one program: size, strength, and leanness. My brand-new hybrid training system combines the fat-burning benefits of full-body training with the muscle-building prowess of body-part splits. I’ve spent over 40 years experimenting to find the best way to train to build muscle, get stronger, and burn body fat. And after four decades of searching in the gym, and three decades spent researching in the lab, I’m proud to say that I’ve found the ideal all-in-one method for reaping great gains in hypertrophy, strength, and fat loss: my Full-Split training system. As the name implies, Full-Split training combines body part-split training (where only a couple muscle groups are trained every workout) and full-body training (where all muscle groups are trained in each workout) into one program. And how, exactly, is it possible to simultaneously train every muscle group in a workout while still focusing on individual body parts? Volume, that's how. With the Full-Split system, you have some workouts of the week where certain muscle groups get higher volume by way of more exercises and sets. And each workout you do includes at least one exercise for each muscle group. This way, you get the muscle-damaging and fatiguing benefits of higher volume workouts for each muscle group with the gene-activating and metabolic-boosting benefits of full-body training. I stumbled onto full-body training in early 2017, after I completely ruptured my right quadriceps tendon in January of that year. Four surgeries later, I was left to hobble around on crutches. This meant that my typical day of weight lifting, running, hiking, cardioacceleration, and other high-impact, high-intensity training practices had to change drastically. How was I going to maintain a presentable physique on social media every day without the ability to train and live the way I was used to? Luckily, I was only one leg down. That meant that I could still train my upper body (with some modifications, of course). And I did have one left leg that I could train, albeit carefully. So I was fairly confident that I could maintain most of my muscle mass during this recovery period. The big question on my mind, however, was this: How am I going to maintain my body fat at 4%-5% year-round? I had always been extremely lean, and I wanted to stay that way, even while dealing with my injury and coming up on 50 years old. That’s when I remembered the research on full-body training and how superior it is for fat loss compared to body part-split training. So I switched my workouts over to full-body training. Well, it was actually three-quarters-body training for me, since I was down one leg at the time! With modifications due to my leg brace, I started hitting full-body workouts, doing one exercise for 3-4 sets for each of the 10 major muscle groups (chest, back, shoulders, traps, abs, triceps, biceps, forearms, legs, calves), five to seven times a week. And as I had hoped (and which was evident to all my followers on social media), the full-body training kept me at 4%-5% body fat and maintained my muscle mass, despite being one leg down and unable to do any conventional cardio. Let me repeat that: I stayed extremely lean with ZERO cardio. The full-body workouts were so effective that on July 2, 2017, I made every one of my workouts available to you for free through my Train With Jim series on my social media pages and JimStoppani.com. 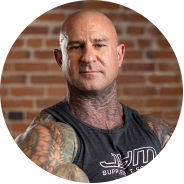 Thousands of JYM Army members followed along, doing my full-body workouts for free with similar hypertrophy and fat-burning results. From a physiological and biochemical perspective, it makes complete sense that full-body training leads to greater fat loss than split training. When you exercise a muscle, you activate genes in that muscle. Those genes boost the metabolic rate of the muscle cells, as well as muscle-growth processes. You also cause fatigue in those muscles, which will require calories for recovery. In other words, each muscle you train in a workout will burn more calories after the workout is over, due to recovery processes and a boost in metabolic rate. It would make perfect sense, then, that if you train 10 muscle groups in a workout, you'll burn more calories and fat than if you train one muscle group. And the research confirms this, let alone the results that myself and thousands of JYM Army experienced. To learn more about on the science and fat-burning benefits of full-body training, read this article: Full-Body Training For Fat Loss. We're not just talking about fat loss here. There's even evidence that full-body training can improve strength gains and muscle growth. In one study, Norwegian researchers had trained powerlifters train the bench press, squat, and deadlift either three or six times per week. They reported that increasing to six times per week led to a doubling of the strength gains experienced by the powerlifters after 12 weeks of training. They also gained about 10% more muscle mass. In the New Zealand study referenced in my "Full-Body Training For Fat Loss" article, the researchers found that when they broke the players up into those who could squat at least double their body weight (strong) and those that couldn’t (weak), the strong players increased muscle strength with full-body training more than those following the split training. They also gained slightly more muscle mass. One of the major complaints that bodybuilders have with full-body training is that they don’t get enough work on each muscle group in each workout. Because you have to train so many body parts, you can only do a few sets per muscle group, otherwise, you’d be in the gym all day, and exhausted. When you compare split-body part to full-body training, however, the total volume (sets per muscle group) is similar over the course of a week. For example, training chest once per week and doing four sets each of four exercises, for a total of 16 sets for chest, is similar to training chest six times per week and doing three sets of one exercise each workout – that ends up being 18 sets of chest for the week. Despite the similarity in volume over the week, limiting each muscle group to only a few sets every workout could limit the total fatigue placed on the target muscle, as well as the total amount of mechanical and chemical damage the muscle receives, not to mention the limited muscle pump. All of these processes may be important for muscle growth, so total volume is not the only important factor for muscle growth. To solve this problem, I added the "split" part to full-body training to create my Full-Split system. The premise is fairly simple: You train certain muscle groups with more volume (more exercises and more total sets) in certain workouts and low volume in other workouts. Take my Full-Body Shortcut To Size (STS) program, which was the inaugural program of my Full-Split training system. STS has you training five days per week. In Workout 1, you train chest with 2-3 sets of four exercises for a total of 9-12 sets for chest. In addition, you do rest-pause or drop sets to further boost the intensity. You also do 2-3 sets of calves for a total of 4-6 sets. For the remaining muscle groups, you do one exercise each for 2-3 sets. In the other four workouts during the week, volume for chest and calves goes back to the standard 2-3 sets per. Workouts 2-5 for STS follow a similar format, only with different muscle groups receiving the additional volume in each workout – back and abs in Workout 2; shoulders and traps in Workout 3; triceps and biceps in Workout 4; and legs and calves in Workout 5. With these workouts, you put all your energy and focus on the target muscle groups receiving the most volume. That way, each muscle group gets at least one workout per week where volume and intensity are high to overload and fatigue the muscle cells properly, and to also enjoy the feel and benefits of the pump. The other eight muscle groups in each workout, then, are trained with less intensity; the point of these exercises is more about keeping the metabolic genes turned on in those muscle fibers for better fat loss and health benefits. One concern people often have regarding my full-body programs is this: Will my muscles be able to recover when they’re trained every day? Don’t individual bodyparts need more rest days? The first thing to realize when discussing my full-body routines (including all of my Full-Split programs) is that, generally speaking, the total weekly volume per muscle group isn’t any greater than it is for my bodypart-split routines like Super Shredded 8, HIIT 100, Down and Up Mass, or any others. I’m increasing training frequency for each muscle group, not volume. For example, consider a full-body program where each muscle group is trained five days a week with one exercise per workout and 3 sets per exercise. The weekly volume for each muscle group in this case is 15 total sets (5 exercises x 3 sets). If I were designing a split routine where each muscle group was only trained once a week (ie, a 4-day or 5-day split), I would program at least 15 sets per week per muscle group, and likely more than that for larger bodyparts like legs, chest, back, and shoulders. The volume is essentially the same, and the intensity remains high. All I’m changing here is frequency. This is one way I’m able to spark new results and avoid plateaus without changing the training volume: by altering other variables, like intensity techniques, rep ranges, tempo (rep speed), rest periods, exercise selection, periodization models, and yes, frequency. There’s only so much you can change volume. I’m not going to keep increasing the total number of sets I do every week; I’d be doing thousands of sets weekly by now if I did! As for rest days, whether you need to give a muscle group one or more days off after training it depends on how hard and with how much volume you trained it. You see a lot of “experts” making hard and fast rules like, “A muscle needs 72 hours of rest before training it again.” If you train that muscle with 16-20 intense sets, then sure, 72 hours of rest (or more) is probably a good idea to let it recover and grow. But if I’m only training a muscle with 3 or 4 sets, and I’m a trained lifter (meaning, I’m in shape and well-conditioned), why does that muscle need 72 hours of rest?! It doesn’t! That muscle will recover adequately with 24 hours of rest, which is what it’s getting in every one of my full-body (or Full-Split) routines. If it’s a 5-days-a-week program and you’re taking the weekend off from lifting, you’re getting a full 72 hours of rest before starting the next week of training. More Rest, More Strength? Not So Fast! The 72-hour rule actually comes from powerlifters. Seventy-two hours of recovery is traditionally believed to be more important for gaining strength than increasing hypertrophy (muscle building); with the latter, the additional stimulus from subsequent daily training sessions is actually beneficial. Yet, the 72-hour rule isn’t even set in stone for maximizing strength. In one Norwegian study, researchers split a team of powerlifters into two different groups. The first group continued trained each major big lift (squat, deadlift, bench press) three times weekly, per their normal routine. The second group performed the same number of total sets per week as the first group, but they increased their training frequency for each big lift/muscle group to six times per week – using double the frequency for the week, but half the volume in each training session. The researchers reported that over the course of 12 weeks, the group training six times per week increased muscle strength roughly twice as much and boosted muscle mass 10% more than the group training three times per week. Let me repeat that: Strength gains were about DOUBLE in the higher frequency group! Just further evidence that rules were meant to be broken, or at least taken with a grain of salt. With my Full-Split routines, “focus” muscle groups in a given workout get more volume than all other bodyparts, but then they go back to lower volume (one exercise per muscle group) the next day. And each muscle group only gets one or two focus days per week with higher volume. The total volume per muscle group in Full-Split programs may hit 20-24 sets, but again, that’s no higher than my typical bodypart-split programs. The point is, how much rest you need is tied to volume. It’s nonsense to think that any amount of training requires 72 hours of rest for recovery. As if 3 sets is going to do the same amount of damage (and thus require the same time length for recovery) as 20 sets. Not even close! When I hit a muscle group with 3-4 sets on Monday, it’s ready for more work on Tuesday. Again, this assumes that I’m not just getting back into training; if you haven’t hit the gym for months, or years, then yes, 3-4 sets for a muscle group will probably require more than 24 hours of rest. Worried that training all 10 muscle groups in every workout, plus additional sets for focus body parts, will take too long? If so, you have a few options. You can split up the workouts, use supersets, or make your own modifications. One way to modify the training is to separate the focus-muscle-groups workout from the other body parts at two different times of day. For example, you can do the chest and calves sets from Workout 1 of SFS in the morning, then do the other eight exercise later in the day. Another way to speed up the workouts is with supersets. Supersetting at least the full-body exercises is one way to speed through them. Also, feel free to use tri-sets, giant sets, or even do all eight non-focus exercises as a circuit that you repeat once or twice to complete 2-3 sets for each exercise. There are many ways that my Stoppani Full-Split (SFS) training system can be applied. In addition to Shortcut To Size, SFS is on display in my Tabata Builder program, and I've also utilized it in both my Super-Man Remastered Challenge and Down and Up Mass Full-Split programs. And feel free to create your own SFS workouts from any of my Train With Jim full-body programs, or ones you've designed on your own. For each workout, simply pick one or two muscle groups to focus on, give each of those body parts 2-4 exercises each, and do one exercise each of all remaining muscle groups. Full-Split training is definitely the best way to train if you want it all – the best results in muscle size, muscle strength, and fat loss, not to mention overall health. After seeing my results and the results of thousands of JYM Army members, it’s the only way I’ll continue to train. But then again, I want it all: size, strength, leanness. Do you? Raastad, T., et al. Powerlifters improved strength and muscular adaptations to a greater extent when equal total training volume was divided into 6 compared to 3 training sessions per week. Book of abstracts, 17th annual conference of the ECSS, 2012.